Lawrence Markey is pleased to announce our upcoming exhibition of work by Fred Sandback (1943–2003), the eighth one-person exhibition of Sandback's work at Lawrence Markey since the gallery's inaugural exhibition in 1990 in New York. This exhibition will inaugurate our new gallery space in San Antonio, Texas. The exhibition will feature an untitled sculpture made from Sandback's signature material of woolen yarn. The form of this sculpture, originally exhibited in 1990 at Galleria Primo Piano in Rome, is a yellow triangle. 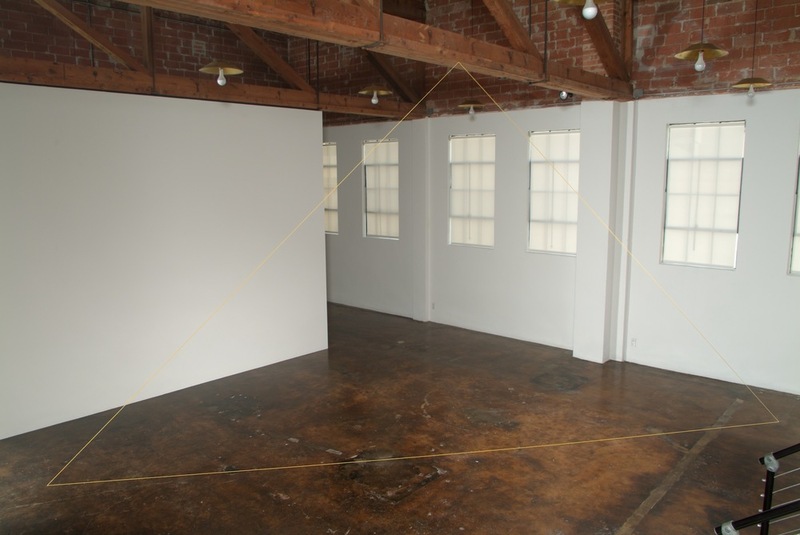 A line of yellow yarn is stretched across the floor of the gallery, and from each end, up to a single point on a wooden beam above. The exhibition will also include works on paper by Fred Sandback. Fortunately, the single sculpture on view here (along with five works on paper) has plenty of breathing room in Mr. Markey's luminous white cube. Conceived by Sandback specifically for this space, it consists of just two lengths of yellow yarn stretched vertically from floor to ceiling, about five feet apart. The straight yellow lines look at once like intensely focused beams of light and ordinary, fuzzy yarn. You may sense a kind of force field that prevents you from walking between them.. To shift back and forth between the illusory and the material like this is a kind of religeous experience. The line is a means to mediate the quality or timbre of a situation, and has a structure which is quick and abstract and more or less thinkable, but it's the tonality or, if you want, wholeness of a situation that is what I'm trying to get at. My intrusions are usually modest, perhaps because it seems like it's that first moment when things start to coalesce that is interesting. Richard Field, Fred Sandback Drawings and Prints, from Fred Sandback Sculpture, Yale University Art Gallery, New Haven and Contemporary Arts Museum, Houston, 1991. It is the irony of many of Sandback's drawings that they are the only permanent - one could say the only physical- record of his sculptures. They work in tandem not only with the viewer's prior experience and memories of the sculpture, but also with the photographic reproductions of the installations. Yet, his drawings are not merely preparatory sketches or records, but independent works with a life of their own, functioning on their own terms. If, in a three dimensional setting, a thread may extract a plane that is uncannily both thread and space, in a drawing, a line may suddenly evoke a space that denies the paper's surface, extracting a mental or conceptual space where there was only flatness. And when one set of lines plays against another (even when two lines oppose a single line) Sandback compounds the mental game. ...Sandback's works on paper are absolutley beguiling: calling attention to the whole question of how one distinguishes between figure and ground, art and setting, they give another meaning to the notion of site-specificity. ...Sandback's drawings reinforce one's sense that he is above all interested in exploring the essence of space as the signifier of human thought. By probing the interstices between flatness and illusion in such subtle (and minimalist) ways, he succeeds in isolating the very moment of human involvement - a moment precisely concurrent with the recognition of space.